The Irish Times reports today that the percentage of children in Ireland who frequently use computers at school is the second-lowest of all industrialised states, according to a new report. The Organisation for Economic Co-operation and Development (OECD) found that in 2003 — the last year for which data is available — only 24 percent of 15-year-olds in Ireland frequently used computers at school. This is a worrying report for the Irish educational system and the hope for Ireland to move to a knowledge economy. The lack of technology funding to schools by the government is largely to blame. It’s been three years since money was made available to schools to purchase equipment. The recent broadband for schools investment was very welcome but many school computers are now over four years old so their use on broadband is limited. I hope that there will be a large injection of cash into technology for schools and most importantly training for teachers so they can get the most from technology. This week is of course Seachtain na Gaeilge (Irish Week) here in Ireland. I’ve noticed a lack of media coverage of Seachtain na Gaeilge this year, but now that the 2006 Oscars are over maybe it’ll kick-in. As current users already know our two flagship products which are developed here in Ireland include both English and Irish versions, Know Your Ireland & Know Your Europe. This week is a very good oppertunity for schools who normally only use the English version to introduce the Irish version to their students. The Irish versions are installed as default and can be accessed via the start menu, Irish worksheets are also included. I also want to inform Irish schools that there is an Irish version of Windows XP and Microsoft Office available from Microsoft Ireland. 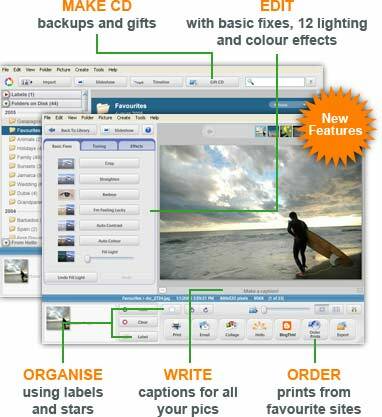 There is loads of free software available which are ideal for school and home use. Over the coming months I will introduce many of these titles to you. The first I must recommend is Picasa, which is part of the Google company and most importantly is free. Picasa is the ideal companion to your digital camera, it allows you to easily import your photos and it will than place them in a virtual photo album where you can edit them. This lets you remove red eye, crop, rotate, brighten and apply special effects. Printing, emailing or uploading your photos to a school blog or website is also very easy. Picasa is a small download and easy to install, just go to www.picasa.com and click Free Download. Our flagship products here at EdWare are Know Your Ireland and Know Your Europe both have been hugely successful and aid the teaching of Irish and European geography throughout schools in the Republic of Ireland. Maps are used extensively to help the user learn about key features of each country/county, cities/towns, mountains and rivers. We are currently at the late stage of developing Know Your USA which will be the most advance K-School targeted geography software package available in the USA. The title will include extensive teaching resources including worksheets and quizzes which can be modified to suit the class needs. At EdWare our software is designed for teaching geography, currently both products target the educational school sector but we recently introduced a consumer version of Know Your Ireland for the USA market. EdWare visited BETT 2006 at the Olympia in London yesterday to check out what’s new for ICT and Education. The show was very interesting and massive when compared to similar shows here in Ireland. We came away with a lot of new ideas and contacts which we hope to put to use over the coming months and launch some new products to the Irish market. Whiteboards and digital projectors were the big attraction with many companies demonstrating new products and more importantly educational uses for the technology. Voting handheld systems were also present for every day use in the classroom. More software designed for this technology is needed before it will really take off. Also the handheld controls which are wireless were not entirely kiddie proof, they resembled a mobile phone/calculator but ideally it should represent the PlayStation Buzz game controller to make it truly user friendly for children Buzz – Relentless Software. The costs is also very high, but in time it could be very useful. Although teachers must remember that classroom activities need to encourage children to speak up and learn to present their ideas to audiences. BETT is the world’s leading educational information and communications technologies (ICT) event, attracting over 600 educational suppliers and 27000 visitors, and bringing together the global teaching and learning community for four days of innovations and inspirations. http://www.bettshow.com. Welcome to the EdWare blog. I will be adding articles over time to cover industry and educational topics. We will of course be covering our latest software updates and new releases by EdWare, there is a lot of exciting projects in the works.